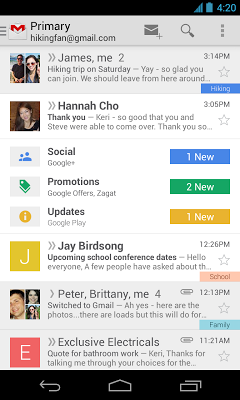 It seems like those rumours about a Gmail redesign was true. The latest video released by Google shows an update the the Gmail interface in your browser. You can easily customize the new inbox - select the tabs you want from all five to none, drag-and-drop to move messages between tabs, set certain senders to always appear in a particular tab and star messages so that they also appear in the Primary tab. Gmial for Android and iOS devices are also getting an upgrade. 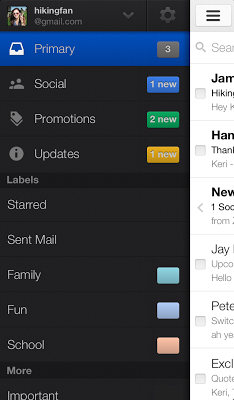 You will be able to see your Primary mail when you open the app and you can easily navigate to the other tabs. The new inbox is rolling out gradually. The desktop, Android and iOS versions will become available within the next few weeks. Shortly after releasing version 4.1 of its keyboard that brought new themes and improvements, the bump to 4.1.1 today brings a few important fixes. First up, those of you with Samsung devices using the stock email app will now have proper text input, without a cursor that jumps around in the paragraph you're typing. Also an important fix, the keyboard will no longer have an unusable "execute" button while typing in the new Google Hangouts app. Additionally, two crashes related to personalization features and using the "Pitch" theme on older Android 2.1 devices have been fixed.